Tholins (after the Greek θολός (tholós) "hazy" or "muddy"; from the ancient Greek word meaning "sepia ink") are a class of heteropolymer molecules formed by solar ultraviolet irradiation of simple organic compounds such as methane or ethane, often in combination with nitrogen. Tholins do not form naturally on modern-day Earth, but they are found in great abundance on the surface of icy bodies in the outer Solar System, and as reddish aerosols in the atmosphere of outer solar system planets and moons. They usually have a reddish-brown appearance. Tholins are not one specific compound but rather are descriptive of a spectrum of molecules that give a reddish, organic surface covering on certain planetary surfaces. Sagan and Khare note "The properties of tholins will depend on the energy source used and the initial abundances of precursors, but a general physical and chemical similarity among the various tholins is evident." 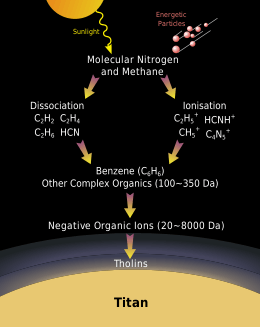 As illustrated to the right, tholins are believed to form through a chain of chemical reactions. This begins with the dissociation and ionization of molecular nitrogen and methane by energetic particles and solar radiation. 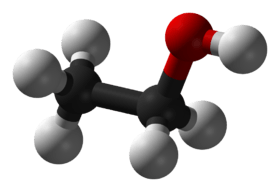 This is followed by the formation of ethylene, ethane, acetylene, hydrogen cyanide, and other small simple molecules and small positive ions. Further reactions form benzene and other organic molecules, and their polymerization leads to the formation of an aerosol of heavier molecules, which then coagulate and deposit on the planetary surface below. Tholins formed at low pressure tend to contain nitrogen atoms in the interior of their molecules, while tholins formed at high pressure are more likely to have nitrogen atoms located in terminal positions. 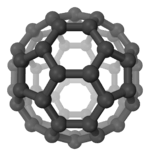 These atmospherically-derived substances are distinct from "ice tholin", which is formed instead by irradiation of clathrates of water and organic compounds such as methane or ethane. Sagan and Khare note the presence of tholins through multiple locations: "as a constituent of the Earth’s primitive oceans and therefore as relevant to the origin of life; as a component of red aerosols in the atmospheres of the outer planets and Titan; as present in comets, carbonaceous chondrites, and pre-planetary solar nebulae; and as a major constituent of the interstellar medium." The surfaces of comets, centaurs, and many icy moons and Kuiper-belt objects in the outer solar system are rich in deposits of tholins. 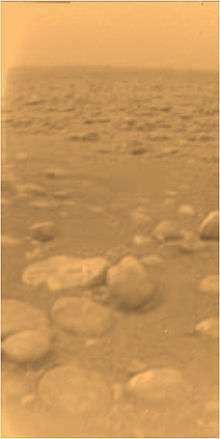 Surface of Titan as viewed from the Huygens probe. Tholins are believed to be the source of the reddish color of both the surface and the atmospheric haze. Titan tholins are nitrogen-rich organic substances produced by the irradiation of the gaseous mixtures of nitrogen and methane found in the atmosphere and surface of Titan. Titan's atmosphere is 98.4% nitrogen and the remaining 1.6% composed of methane and trace amounts of other gases. In the case of Titan, the haze and orange-red color of its atmosphere is thought to be caused by the presence of tholins. Neptune's moon Triton is observed to have the reddish color characteristic of tholins. Triton's atmosphere is 99.9% nitrogen and 0.1% methane. Tholins also occur on the dwarf planet Pluto and its moon Charon and are responsible for their red colors as well as the blue tint of Pluto's atmosphere. In September 2016, astronomers announced that the reddish-brown cap of the north pole of Charon, the largest of five moons that orbit the dwarf planet Pluto, is composed of tholins, organic macromolecules that may be essential ingredients of life, and produced from methane, nitrogen and related gases released from the atmosphere of Pluto and transferred over about 19,000 km (12,000 mi) distance to the orbiting moon. The plutino Ixion is also high in this substance. Tholins might have also been detected in the stellar system of an eight-million-year-old star known as HR 4796A using the Near-Infrared Camera and Multi-Object Spectrometer (NICMOS) aboard the Hubble Space Telescope. The HR 4796 system is approximately 220 light years from Earth. Some researchers have speculated that Earth may have been seeded by organic compounds early in its development by tholin-rich comets, providing the raw material necessary for life to develop (see Miller-Urey experiment for discussion related to this issue). Tholins do not exist naturally on present-day Earth due to the oxidizing character of the free oxygen component of its atmosphere ever since the Great Oxygenation Event around 2.4 billion years ago. Tholins can act as an effective screen for protecting planetary surfaces from ultraviolet radiation. A wide variety of soil bacteria are able to use tholins as their sole source of carbon. Tholins could have been the first microbial food for heterotrophic microorganisms before autotrophy evolved. ↑ Wiktionary: θολός. Retrieved 30 Nov 2016. 1 2 Sarah Hörst, "What in the world(s) are tholins? ", Planetary Society, July 23, 2015. Retrieved 30 Nov 2016. 1 2 3 4 5 Sagan, Carl & Khare, Bishun (11 January 1979). "Tholins: organic chemistry of interstellar grains and gas". Nature. 277 (5692): 102–107. Bibcode:1979Natur.277..102S. doi:10.1038/277102a0. 1 2 Waite, J.H. ; Young, D.T. ; Cravens, T.E. ; Coates, A.J. ; Crary, F.J.; Magee, B.; Westlake, J. (2007). "The process of tholin formation in Titan's upper atmosphere". Science. 316 (5826): 870–5. Bibcode:2007Sci...316..870W. doi:10.1126/science.1139727. PMID 17495166. ↑ McGuigan, M.A. ; Waite, J.H. ; Imanaka, H.; Sacks, R.D. (2006). "Analysis of Titan tholin pyrolysis products by comprehensive two-dimensional gas chromatography-time-of-flight mass spectrometry". J. Chromatography. 1132 (1-2): 280–288. doi:10.1016/j.chroma.2006.07.069. ↑ McDonald, G.D.; Whited, L.J. ; DeRuiter, C.; Khare, B.N. ; Patnaik, A.; Sagan, C. "Production and chemical analysis of cometary ice tholins". Icarus. 122 (1): 107–117. Bibcode:1996Icar..122..107M. doi:10.1006/icar.1996.0112. 1 2 Gene D. McDonald, W.Reid Thompson, Michael Heinrich, Bishun N. Khare, and Carl Sagan, "Chemical Investigation of Titan and Triton Tholins"], Icarus Volume 108, Issue 1, March 1994, pp 137-145; doi:10.1006/icar.1994.1046. Retrieved 30 Nov 2016. ↑ "Pluto: The 'Other' Red Planet". NASA. 3 July 2015. Retrieved 2015-07-06. Experts have long thought that reddish substances are generated as a particular color of ultraviolet light from the sun, called Lyman-alpha, strikes molecules of the gas methane (CH4) in Pluto's atmosphere, powering chemical reactions that create complex compounds called tholins. ↑ Albert, P.T. (9 September 2015). "New Horizons Probes the Mystery of Charon's Red Pole". NASA. Retrieved 2015-09-09. 1 2 Bromwich, Jonah Engel; St. Fleur, Nicholas (14 September 2016). "Why Pluto's Moon Charon Wears a Red Cap". New York Times. Retrieved 14 September 2016. ↑ Amos, Jonathan (2015-10-08). New Horizons: Probe captures Pluto's blue hazes. BBC News, 8 October 2015. Retrieved from http://www.bbc.com/news/science-environment-34481347. ↑ Kohler, M.; Mann, I.; Li, A. (2008). "Complex organic materials in the HR 4796A disk?". The Astrophysical Journal. 686 (2): L95–L98. Bibcode:2008ApJ...686L..95K. doi:10.1086/592961. ↑ Base Peak, "Mooning over Titan's atmosphere", SpectroscopyNOW, 15 October 2006. ↑ Stoker, C.R. ; Boston, P.J. ; Mancinelli, R.L. ; Segal, W.; Khare, B.N. ; Sagan, C. (1990). "Microbial metabolism of tholin". Icarus. 85 (1): 241–256. Bibcode:1990Icar...85..241S. doi:10.1016/0019-1035(90)90114-O.